The picker is actually familiar to designers/developers as it is the same one that comes with WebKit DevTools (created by the same developer) but now available as a jQuery plugin. 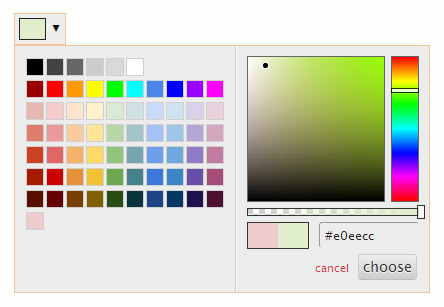 It has support for color palettes by storing/displaying the colors you chose, the default selected color can be set or it can be configured to only display the palette with pre-defined colors. Alpha transparency selection is available, can be always visible (without clicking to a picker icon) and supports multiple color formats. Spectrum can be customized with CSS and it works on mobile as well.